Therapeutic Riding Program - The Right Step, Inc.
Disabilities do not have to limit a person from riding horses. Throughout the world, there are many individuals with special needs who experience the rewarding benefits of horseback riding. 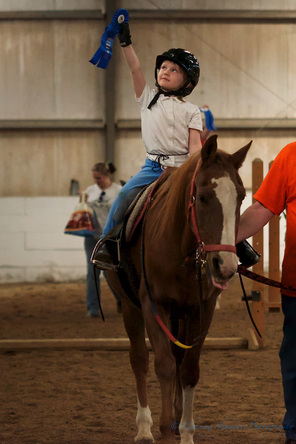 Therapeutic riding provides many benefits to people with disabilities. At the most basic level, it is an accessible form of outdoor recreation. People with disabilities also experience improvement in their cognitive, physical, emotional and social well-being thanks to the equine assisted activities utilized in therapeutic riding. Experiencing the motion of a horse is very therapeutic. Horseback riding rhythmically moves the rider's body in a manner similar to a human gait, so riders with physical disabilities often show improvement in flexibility, balance and muscle strength. As a Premier Center, professional staff and volunteers work closely with riders to ensure safe riding sessions. A new rider is generally assisted by at least two side walkers who walk alongside the horse, as well as a horse leader. Riding classes are taught by instructors who have strong equine backgrounds, and understand various disabilities.